I wasn't so sure what I would think about this dish when I first saw the recipe. 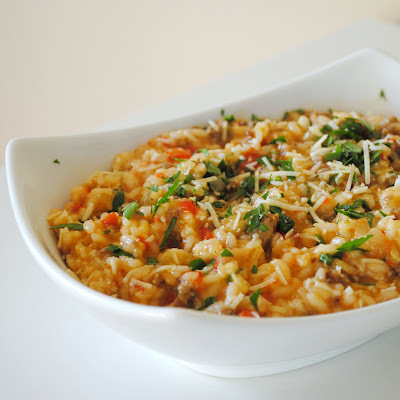 I've only ever made risotto once before and last time I made it as a side dish rather than including meat. But once I saw the recipe, I couldn't get it out of my head. I figured it might be a little too much work for a weeknight dinner since risotto pretty much requires thirty minutes next to the stove and I generally like to multitask during weeknight cooking. Friday I was going to make it but then my husband suggested going out for Mexican food and I don't really ever turn down chips and salsa. Saturday we already had dinner plans too. By Sunday, I was still thinking about this risotto so I picked up what I needed when I did my grocery shopping and got to work. 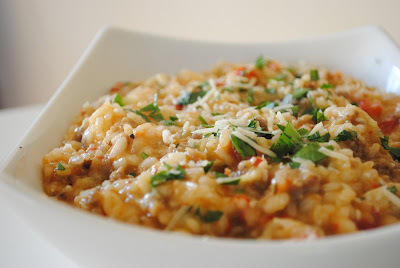 So the verdict - turns out, risotto works great as a main dish. This was absolutely delicious. I halved the original recipe because it was just the two of us eating and I didn't want leftover risotto all week (there was enough leftover for a lunch the next day). I also increased the amount of sausage in the recipe, mostly because I'm bad at halving recipes because I sometimes forget to halve all the ingredients but I would make it the same way again. I think I would cut it back if I was serving it as a side dish but for a main course, its perfect. I used ground turkey sausage in this dish to cut down on the fat and it worked perfectly, but you could also use sausage links (remove the casings) or traditional pork sausage. The other changes I made were to cut out the mushrooms (I don't like them), add a clove of garlic and decrease the salt (even with low sodium chicken broth, I don't think it needed any extra). Simmer chicken stock in a small saucepan over medium heat. Add butter to a large skillet or saucepan over medium heat. Add sausage and break up with a wooden spatula as it browns, cook about five minutes. Add garlic, red pepper and onion and cook about eight minutes until softened, scraping up the brown bits on the bottom of the pan as it cooks. Add black pepper and rice, stir to coat. Add wine and cook until liquid is almost all evaporated, about one minute. Add chicken stock, one ladle at a time, to the rice mixture. Stir almost constantly. When the liquid is almost completely absorbed, add another ladle full. Repeat this process until you have added all the stock to the rice mixture. This process will take about twenty to thirty minutes. 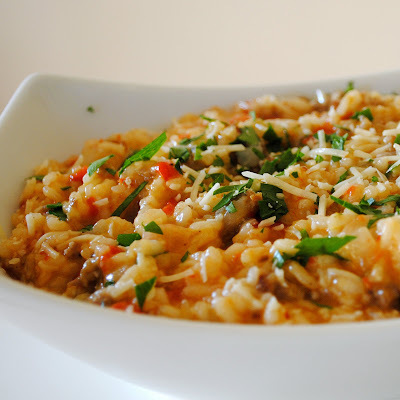 The rice mixture should be thick and creamy. The rice should still be al dente but not hard. Add 3/4 of the cheese and stir to combine. Transfer to serving dish and top with chopped parsley and remaining cheese. Serve immediately. Can't wait to make this recipe--thanks for sharing! This would be one tasty risotto! This recipe seems absolutely delicious! I would love to cook it but I am not sure what a "T" is. (Maybe a tablespoon?) Would you please enlighten me? Thanks and congratulation for your fabulous blog! Hi Holman, this is Diana from TasteSpotting! MMM this was so delicious! Just made it tonight. I used 5 turkey sausages instead, 1/4 cup low calorie white wine, 3 1/4 cups chicken stock, a handful of mushrooms, the full onion, 1 cup of rice and omitted the butter. I am soooooo happy! Its just wonderful. Fed my family of 4 perfectly with a big serving left over for tomorrow. @ Kayla - I love it when readers post comments indicating that they've actually made the recipe. Hate it when readers post comments saying the recipe 'looks good' but they haven't actually cooked it. They're not adding anything of value.